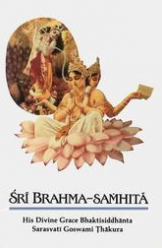 Kapila’s teachings are originally inscribed in the Śrīmad-Bhāgavatam, or Bhāgavata Purāṇa, one of the most important scriptural documents of Vedic theism. Within the Bhāgavatam, Kapila’s teachings comprise Chapters Twenty-five through Thirty-three of the Third Canto. 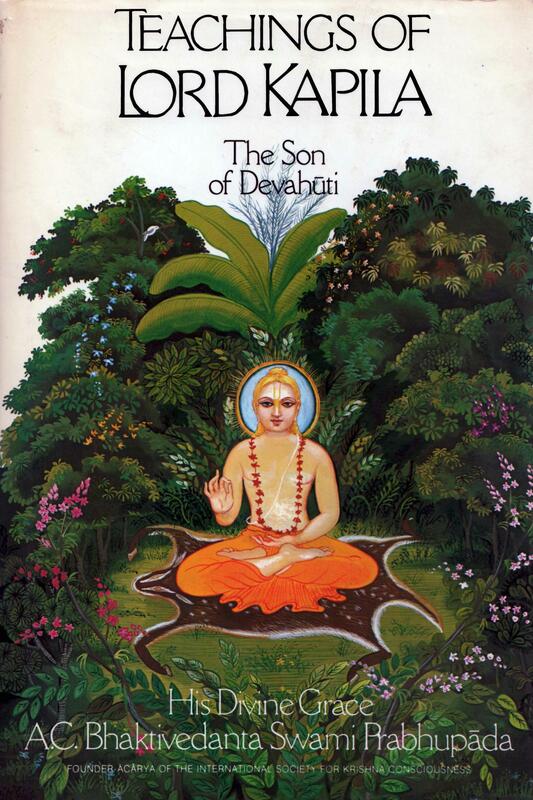 This book, Teachings of Lord Kapila, the Son of Devahūti, is based on a unique series of lectures presented in Bombay, India, in the spring of this series, Śrīla Prabhupāda spoke from the Twenty-fifth Chapter, which contains the beginning of Lord Kapila’s teachings. Śrīla Prabhupāda is the author of a celebrated multivolume translation and commentary on the entire text of the Bhāgavatam, and at the time of the Kapila lectures he had already completed his written commentary on the section of the Bhāgavatam dealing with Kapiladeva’s teachings. In these special lectures, however, Śrīla Prabhupāda went into significantly greater detail in elucidating the verses and shed an even broader light upon these fascinating teachings. After Kardama Muni’s departure, Devahūti, remembering the prophetic words of Lord Brahmā, approaches her divine son and humbly expresses her desire for spiritual enlightenment: “My Lord, I have fallen into the abyss of ignorance. Your Lordship is my only means of getting out of this darkest region of ignorance because You are my transcendental eye, which, by Your mercy only, I have attained after many, many births…. Now be pleased, my Lord, to dispel my great delusion… You are the ax which can cut the tree of material existence. I therefore offer my obeisances to You, who are the greatest of all transcendentalists, and I inquire from You as to the relationship between man and woman and between spirit and matter.” (Śrīmad-Bhāgavatam 3.25.7–11) Pleased by His mother’s pure desire for spiritual enlightenment, and feeling great compassion for her, Kapila begins to speak on the Sāṅkhya philosophy. It is interesting to note, at this point, that long after Lord Kapila’s descent, an imitation Kapila appeared on the Indian subcontinent and propounded a nontheistic Sāṅkhya. That which is generally studied as Sāṅkhya in the contemporary academic context is actually this later, nontheistic, materialistic Sāṅkhya. The Sāṅkhya philosophy, propounded by the original Kapila, is practically unknown in the West. Teachings of Lord Kapila, the Son of Devahūti (along with Śrīla Prabhupāda’s complete commentary on Kapila’s Sāṅkhya in his edition of Śrīmad-Bhāgavatam) is probably the first major exposition in the English language on the original, theistic Sāṅkhya. It should therefore be of considerable interest to scholars in this field. Because the basic principle and the ultimate goal of Lord Kapiladeva’s Sāṅkhya philosophy is bhakti, this is the subject with which Lord Kapiladeva begins His instructions to Devahūti. Consequently, because this volume, Teachings of Lord Kapila, the Son of Devahūti, is Śrīla Prabhupāda’s commentary on the beginning of Lord Kapila’s teachings, it is chiefly concerned with the science of bhakti-yoga—the process of linking with God (yoga means “linking”) through bhakti (devotion). As the actual history begins, Devahūti approaches her son, Kapila, and with deep humility expresses her sincere desire for spiritual enlightenment. In response, Lord Kapila delineates “the path of the transcendentalists, who are interested in self-realization.” Concisely summarizing the actual process of self-realization, Kapila defines consciousness in both the conditioned and liberated states. He describes the psychology of pure consciousness, delineates the symptoms and characteristics of a sādhu, holy person, and stresses the importance of sādhu-saṅga, association with those who are saintly. Kapiladeva then explains that liberation is merely a stage preliminary to the attainment of bhakti and that one who attains bhakti automatically achieves liberation. One who engages in bhakti, devotional yoga, automatically transcends material desires and ultimately crosses beyond birth and death.